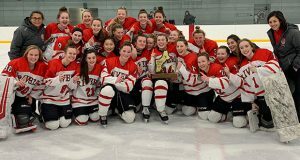 Any thoughts of a new #1 team in the HNIB News Girls Prep Division I poll were erased Saturday when Becca Gilmore of Nobles scored in the third period to give the Bulldawgs a 1-1 tie with St. Paul’s in their key showdown. Nobles (24-0-1) holds on to the top spot, just ahead of #2 St. Paul’s (20-0-2), as the final week of the regular season commences. The ‘Dawgs also cruised to wins over Andover (7-o) and Thayer (8-1) this week. 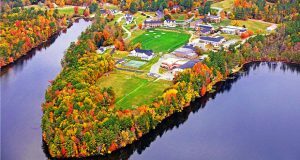 They should get the top seed in the New England playoffs, provided they don’t slip up this week against Governor’s Academy and Milton. St. Paul’s did have all they could handle at BB&N last Wednesday, escaping with a 4-3 overtime win. They close out the regular season with three games this week: New Hampton on Wednesday (5:oo pm), St. George’s on Wednesday (4:00pm) and at Lawrence Academy Saturday (4:30pm). Tabor (14-2-3) continues to hold down the #3 spot, beating Exeter, 3-0, in its only game this past week ( a game with Brooks was cancelled due to weather). The Seawolves should be OK for the post-season, but do end the regular season on a three-game road trip: at Andover (Monday, 5:oopm), at Cushing (Wednesday, 3:00pm) and at Thayer (Saturday, 2:10pm). From here, it’s a crapshoot, with results from the coming week determining playoff placement, or even if a team does or does not get in to the eight-team field. Pomfret (11-5-2) slides up a spot to #4. After tying Berkshire earlier this week, the Griffins downed Cushing, 5-2. The Griffins could get a home playoff game, but need to take care of business against Milton Academy on Wednesday and Winchendon on Saturday. Westminster (13-6-2) holds down the #5 spot, taking wins this week over Taft (4-0) and Deerfield (4-0) and tying Berkshire (1-1). The Martlets close the regular season with a pair of road games, at Andover Wednesday (4:00 pm) and at Kent on Saturday (7:00 pm) in what could be a meaningful game. Could Choate (13-5-3) be making a late-season run? The Wild Boars, in the midst of six straight games on the road, swept wins over Kingswood (3-1), Berkshire (3-2) and Taft (3-0) to move up to #6. Wins this week over Hotchkiss Wednesday (4:30 pm) and Cushing Saturday (4:oo pm) would certainly improve its playoff standing. #7 Loomis Chaffee (12-7-0) moves up after a key 1-0 win over Williston on Saturday. The Pelicans also blanked Kingswood (5-0). They may need to beat both Northfield Wednesday (4:oo pm) and Deerfield Saturday (away, 2:oo pm) to get a berth. With that 1-0 loss to Loomis, Williston (15-5-3) now finds itself ranked #8, but certainly in the mix. The Wildcats did pick up a 5-1 win over Northfield, and have a three-game week that should determine their fate: hosting Deerfield on Wednesday (2:45 pm) and BB&N on Saturday (2:00 pm), and a road game Friday night at Winchendon (5:00 pm). 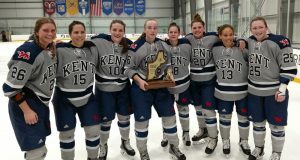 #9 Kent (10-5-3) is still hoping to nab a playoff berth, especially after tying Hotchkiss (2-2) and beating Kingswood (2-1). 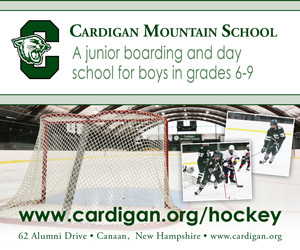 Two tough games remain, against Gunnery Wednesday (4:oo pm) and the aforementioned battle with Westminster Saturday. Joining the poll this week is #10 Hotchkiss (9-7-2). The Bearcats have played well against the contenders in recent going. They host Choate Wednesday and close things out with Taft on Saturday. The eight Division I playoff teams and quarterfinal pairings will be announced on Sunday, February 23rd, with quarterfinal action taking place on Wednesday, February 26th.